You might have come across cases where an individual or a company takes a Bank Loan and doesn’t pay back for various reasons. 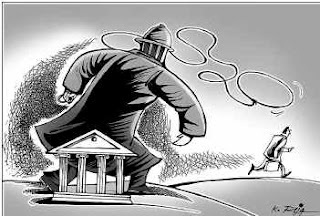 While he/company becomes a defaulter, Banks also tend to have their equivalent amount locked up. It makes effort for recovery and depending upon the case, a part of, entire amount or nil recovery is made. These are broadly classified as what’s called in Bank’s parlance a “Non-Performing asset (NPA)”. 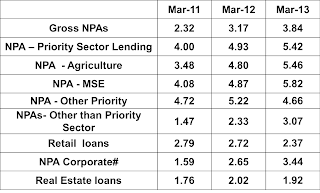 Let’s examine NPA in Indian context, what it means, various degrees, its magnitude and implications. viii. in case of interest payments, banks should, classify an account as NPA only if the interest due and charged during any quarter is not serviced fully within 90 days from the end of the quarter. Sub-standard Assets - A substandard asset is one, which has remained NPA for a period less than or equal to 12 months. Such an asset will have well defined credit weaknesses that jeopardise the liquidation of the debt and are characterised by the distinct possibility that the banks will sustain some loss, if deficiencies are not corrected. Doubtful Assets - An asset is classified as doubtful if it has remained in the substandard category for a period of 12 months. A loan classified as doubtful has all the weaknesses inherent in assets that were classified as substandard, with the added characteristic that the weaknesses make collection or liquidation in full, – on the basis of currently known facts, conditions and values – highly questionable and improbable. 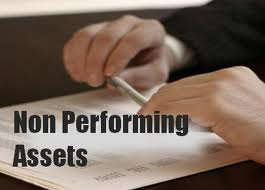 Loss Assets - A loss asset is one where loss has been identified by the bank or internal or external auditors or the RBI inspection but the amount has not been written off wholly. In other words, such an asset is considered uncollectible and of such little value that its continuance as a bankable asset is not warranted although there may be some salvage or recovery value. 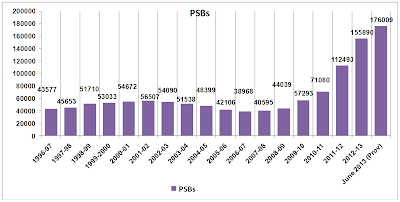 As per the data made available by the Reserve Bank of India (RBI), Gross NPAs of the Scheduled Commercial Banks SCBs), especially Public Sector Banks (PSBs) have shown an increase during the recent years i.e. Rs. 1,76,009 crore (June, 2013, GNPA ratio 4.39%, provisional). Although GNPAs have increased at system level, the GNPAs ratios of banks do not indicate systemic vulnerability. 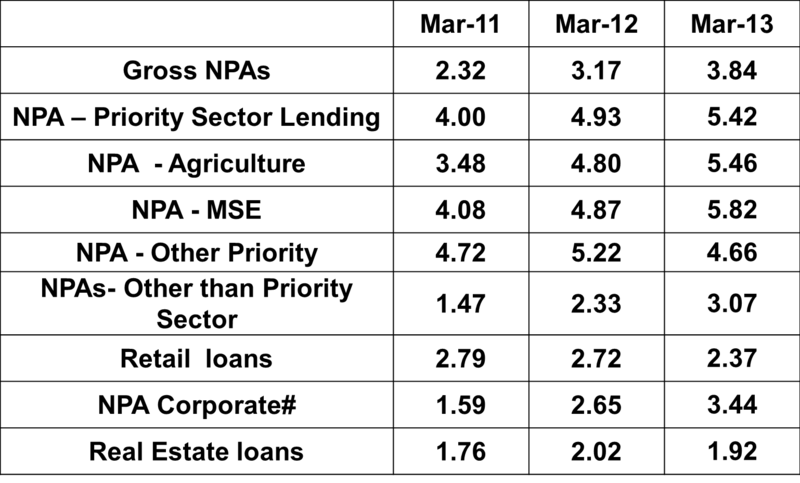 Main reasons for increase in NPAs of banks, inter-alia, are (I) switch over to System Based Identification of NPAs as against the manual compilation earlier where individual officers tended to suppress the extent, (ii) current macro-economic situation in the country, (iii) increased interest rates in the recent past, (iv) lower economic growth in 2011-12 (6.2 per cent) and 2012-13 (5.0 per cent) and (v) aggressive lending by banks in the past, especially during good times. (i) The Securitization and Reconstruction of Financial Assets and Enforcement of Security Interest (SARFAESI) Act, 2002 – The Act empowers Banks / Financial Institutions to recover their non-performing assets without the intervention of the Court, through acquiring and disposing of the secured assets in NPA accounts with outstanding amount of Rs. 1.00 lakh and above. (ii) Recovery of Debts Due to Banks and Financial Institutions (DRT) Act: The Act provides setting up of Debt Recovery Tribunals (DRTs) and Debt Recovery Appellate Tribunals (DRATs) for expeditious and exclusive disposal of suits filed by banks / FIs for recovery of their dues in NPA accounts with outstanding amount of Rs. 10 lac and above. Government has, so far, set up 33 DRTs and 5 DRATs all over the country. (iii) Lok Adalats: Section 89 of the Civil Procedure Code provides resolution of disputes through ADR methods such as Arbitration, Conciliation, Lok Adalats and Mediation. Lok Adalat mechanism offers expeditious, in-expensive and mutually acceptable way of settlement of disputes. Government has advised the public sector banks to utilize this mechanism to its fullest potential for recovery in Non-performing Assets (NPAs) cases. 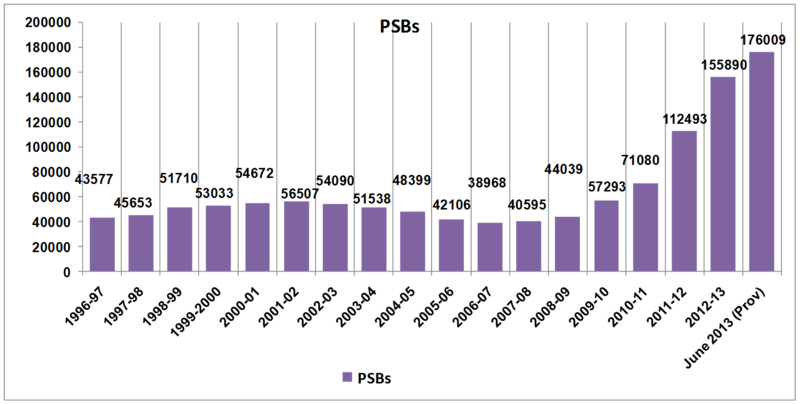 Among the various channels of recovery available to banks for dealing with bad loans, the SARFAESI Act and the Debt Recovery Tribunals (DRTs) have been the most effective in terms of amount recovered. Ø To have a Board approved loan recovery policy. Ø To put in place an effective mechanism for information sharing for sanction of fresh loans/ad-hoc loans/renewal of loans to new or existing borrowers. Ø taking recourse to legal mechanisms like SARFAESI Act, 2002, DRTs and Lok Adalats. Ø To review NPA accounts of Rs. 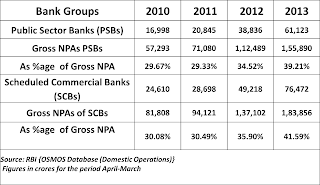 1 crore and above by Board of Directors and top 300 NPA accounts by Management Committee of the Board. 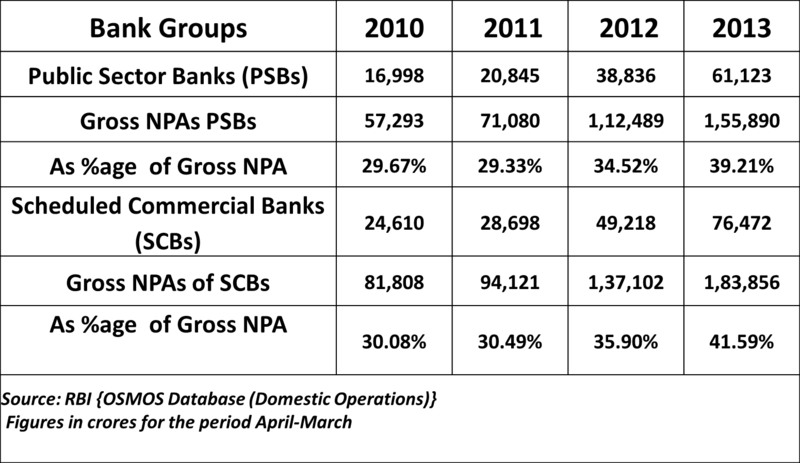 While Banks do provide for "write-offs" in their annual accounts to take into account for losses on account of not realizable NPAs, it has to be remembered that it comes at the cost of capitalization by an equivalent amount and thus affect the performance and financial health of the Bank directly in the long run. The answer lies in prudent lending, being in constant touch with the creditors, close monitoring and follow up on the timely action. Thanks for sharing. When your focus is on asset health, your focus is on early identification and elimination of the defect.